Tyne and Wear Metro's new mascot will be at Tynemouth Blue Reef Aquarium this weekend. Picture by Craig Leng. Families are being encouraged to meet the latest star of a media campaign. Tyne and Wear Metro’s famous ‘M’ logo has been brought to life for a new TV advert. And the mascot will be at Blue Reef Aquarium, Tynemouth, from Friday, July 24, to Sunday, July 26. Children can have their picture taken with the character between 11am and 3pm each day, and pick up a free kids’ activity pack, while the Metro team will be handing out spot prizes. 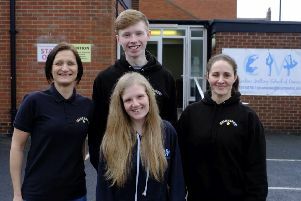 Rosie Wiggin, sales and marketing manager at Blue Reef Aquarium, said: “It’s very exciting to be welcoming the Metro mascot to Blue Reef Aquarium. “This weekend, we’re inviting visitors to dust off their boots, chaps and cowboy hats, to come and help us celebrate the re-opening of our newly-refurbished ocean tunnel and the arrival of a pair of cownose rays with a family fun-filled rodeo. “We’ve got lots of activities, including pony rides, a bucking bronco, on Saturday, a backyard BBQ and watering hole, coconut shy, hoopla, tin-can shoot-out, a quiz trail and lots of prizes. The attraction is also part of a campaign encouraging families to see more of the region. This summer, visitors to Blue Reef Aquarium who have a valid Metro ticket or Pop card can save £2 on entry or one free child entry for every full paying adult. Emma Brough, customer service director at DB Regio Tyne and Wear, which operates the Metro on behalf of Nexus, said: “We’re encouraging our customers to make a day of it this summer by exploring as many of the fantastic places to go and visit in our region.